^ a b c 祁英力 2002, p. 4. ^ 祁英力 2002, p. 11. ^ 祁英力 2002, p. 12. ^ 祁英力 2002, p. 13. ^ 祁英力 2002, p. 14l. ^ 祁英力 2002, p. 14. ^ a b c 祁英力 2002, p. 20. ^ 祁英力 2002, pp. 21-22. ^ a b c 祁英力 2002, p. 22. ^ 祁英力 2002, p. 29. ^ 祁英力 2002, pp. 33-34. ^ 祁英力 2002, p. 36. ^ 祁英力 2002, p. 39. ^ 祁英力 2002, p. 40. ^ a b 祁英力 2002, p. 41. ^ 祁英力 2002, p. 42. ^ a b 祁英力 2002, p. 43. ^ 祁英力 2002, p. 44. ^ 祁英力 2002, pp. 41-42. ^ 祁英力 2002, p. 57. ^ Nathan, Andrew J. (Biography); Gilley, Bruce (Biography) (March 2003). China's new rulers: the secret files (Article). New York: The New York Review of Books, p.79. ^ 祁英力 2002, p. 63. ^ 祁英力 2002, pp. 64-65. ^ 祁英力 2002, p. 69. ^ 祁英力 2002, pp. 78-79. ^ 祁英力 2002, p. 80. ^ 祁英力 2002, p. 85. ^ 祁英力 2002, p. 86. ^ 祁英力 2002, p. 88. ^ 祁英力 2002, pp. 88-89. ^ 祁英力 2002, pp. 90-91. ^ 祁英力 2002, p. 96. ^ a b Nathan & Gilley, p.42. ^ 祁英力 2002, pp. 98-99. ^ 祁英力 2002, pp. 103-105. ^ 祁英力 2002, p. 106. ^ 祁英力 2002, pp. 114-115. 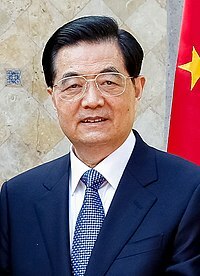 ^ "Profile: Hu Jintao", BBC News, September 16, 2004. ^ a b Nathan & Gilley, p.81. ^ Nathan & Gilley, pp.42 - 43. ^ Nathan & Gilley, p. 84. ^ 祁英力 2002, p. 270. ^ 祁英力 2002, p. 201. ^ 祁英力 2002, p. 194. ^ Data (2016年7月22日). “"Gross domestic product 2015, PPP", World Bank, accessed on 26 July 2016”. Data.worldbank.org. 2016年7月26日閲覧。 ; European Union calculated by sum of individual countries. 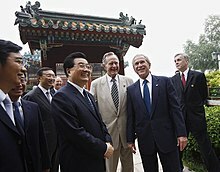 ^ "Hu Jintao reelected Chinese president", Xinhua(China Daily), March 15, 2008. ^ 祁英力 2002, p. 262. ^ 祁英力 2002, p. 91. ^ 祁英力 2002, p. 10. ^ 祁英力 2002, pp. 14-15. ^ 祁英力 2002, p. 16.